Or as low as $150.00 per month over 12 months. Apply Now. Or as low as $57.50 per month over 12 months. Apply Now. The JL Audio HO112R-W7AE H.O. (High Output) subwoofer enclosure system is designed around JL Audio’s flagship 12W7AE-3 subwoofer, delivering very high SPL while retaining excellent sound quality. The enclosure features solid V-groove MDF construction with internal bracing to ensure structural integrity. It has an angled back to help save space in the cargo area. Using JL Audio’s patented chamber-coupled port design, the slot-port wraps around the inside of the enclosure and terminates just above the woofer, coupling the port output to the woofer’s direct output. This design provides the necessary surface area and port length to maximize the performance of the subwoofer. The enclosure’s recessed mounting baffle also provides protection for the woofer. Terminal: The enclosure features a pair of gold plated 5-way binding posts on the left side. They will accept pin connectors, spade connectors, single banana plugs, dual banana plugs (standard 3/4″ width), and bare wire up to 10 gauge. W-Cone: The JL Audio HO112R-W7AE subwoofer utilizes a W-Cone design, a unit-body cone assembly, that maximizes cone stiffness with minimal mass. The shape also provides torsional rigidity, critical to maintaining voice coil alignment at the suspension limits. In order to gain maximum stiffness, two lightweight mineral-filled polypropylene skins are bonded together at the perimeter and the center of the assembly. The lower skin’s cross-section is shaped like a “W”, and provides incredible rigidity when bonded to the dished upper skin. OverRoll Surround: OverRoll Surround technology allows JL Audio to make full use of the entire footprint of the speaker, placing the surround further to the outside of the frame than in a conventional woofer. 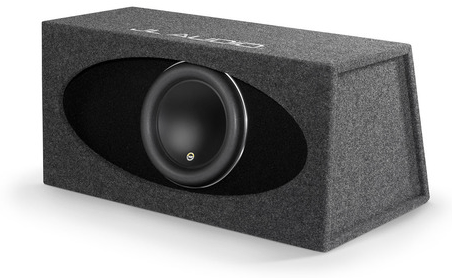 This means that JL Audio HO112R-W7AE subwoofer can use a large roll for all its benefits without sacrificing cone area. By maximizing the effective piston/total footprint ratio, the W7AE subwoofer can deliver more output for a given excursion and outside frame diameter. This means the excursion advantage of the W7AE can be put to full use enhancing output, rather than making up for lost piston area. This technology also provides a geometry advantage on the outside edge of the surround roll, allowing more linear operation. A further benefit is that the mounting holes are inherently sealed by the surround, resulting in an improved box seal. Ultra-Long Voice Coil: TheJL Audio HO112R-W7AE subwoofers feature an ultra-long voice coil to enhance linear excursion, power handling and control. The large surface area of the coil offers excellent heat dissipation, while the winding height provides the necessary motivational force to achieve the excursion of the W7AE design. Floating Cone Attachment Method (FCAM): JL Audio’s patented FCAM technology is an innovative method of bonding the surround/cone assembly to the voice coil/spider assembly. This assembly technique ensures proper surround geometry in the assembled speaker for better excursion control and dynamic voice coil alignment. Dynamic Motor Analysis (DMA): DMA is JL Audio’s proprietary method of improving dynamic motor behavior. As a result of DMA optimization, W7AE motors maintain linear motor force over a very long range of excursion, and also maintain a highly stable fixed magnetic field in the gap over a wide power range. The result is reduced distortion, faithfully reproduced transients, and tight, clean, articulate bass. Forced Air Cooled: The elevated frame design of the JL Audio HO112R-W7AE delivers cool air through slots directly above the top-plate to the voice coil of the speaker. This not only enhances power handling, but also sound quality by minimizing dynamic parameter shifts and power compression. Radial Cross-Drilled Pole Piece: This venting system enhances heat dissipation and power handling by directing air flow onto the voice coil former, working in conjunction with the Forced Air Cooling technology. Progressive-Roll Spider: The large, progressive-roll spider provides precise control and motor/voice coil alignment without limiting excursion prematurely. Plateau-Reinforced Spider Attachment: A derivative of JL Audio’s VRC technology, this suspension attachment relieves stress from the spider material at high excursions for enhanced reliability. Co-Extruded Double Lead Wires: The extruded casing and carefully engineered attachments ensure controlled lead-wire behavior under the most extreme excursion demands. Two conductors are used per connection for ample current carrying capability.